- The 1868 edition corrected by Dickens in 1867-68. - Includes a preface by Dickens, plus an editor’s note. - Contains all 12 of George Cruikshank’s original illustrations. - Also contains 16 photographs from the Her Majesty’s Theatre performance of Oliver Twist. - Fully-searchable table of contents. 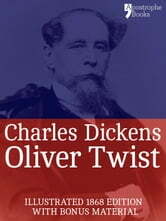 Dickens’ exceptional second novel tells the story of orphan boy Oliver Twist, who escapes the misery of the workhouse only to fall in with a gang of London crooks, led by the legendary Fagin. 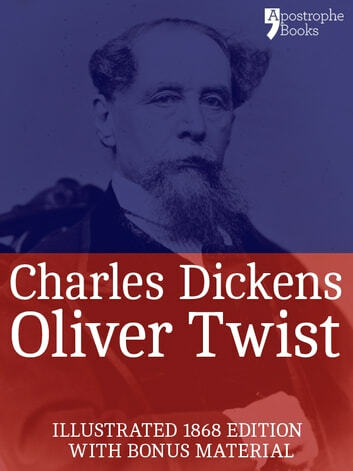 The literary masterpiece uses dark humour to shine a light on the real poverty blighting London life in the 19th century, as Dickens – himself once a child labourer – explains in the rare foreword to this Apostrophe Books edition.